This week’s menu (available online here) was plucked from the Fall section. It calls for fresh corn, tomatoes and okra, which we bought from the local produce stand, so I am not sure why she thinks I should be making this later in the year. We are doing Indian this week! I was very, VERY worried about how this would turn out. The recipe calls for making a rub of garam masala, salt and pepper and smushing it onto some lamb chops and letting them sit for 20 minutes before grilling on med-high heat. 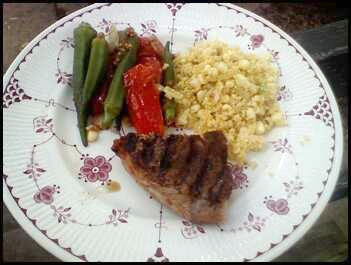 I used a lamb steak instead, and the meat sat for about an hour before I cooked it. Lemme tell you, this was awesome! As you may remember, I don’t like lamb, and yet, it was so tasty and moist! Love. I still only ate a wee bit, since I felt guilty, but damn you Martha for making me weaken in my stance to avoid eating baby sheep! This is a great menu to make when it’s hot as it involves little cooking time, and no baking. (So, why is it in the Fall section?) I made a dressing of whole-grain mustard, white wine vinegar, curry powder (I used half Madras and half sweet) and salt and pepper. 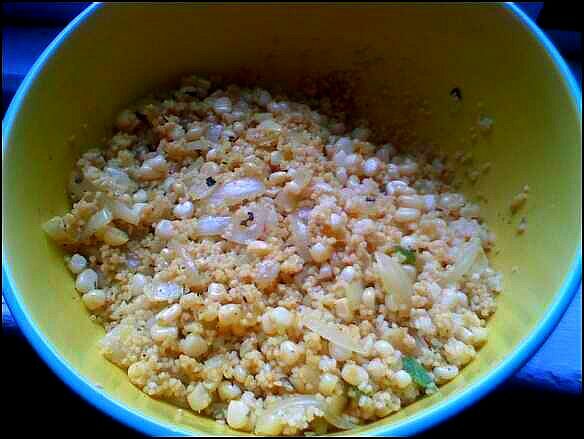 I tossed the cooked couscous, sautéed fresh corn and a jalapeno with the dressing and cilantro. 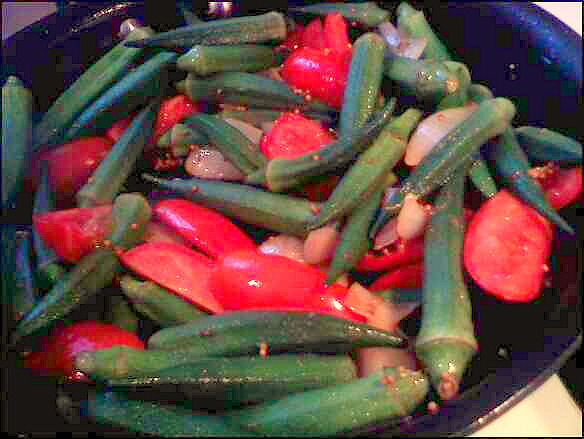 Onions, then okra, then tomatoes were sautéed in a mixture of olive oil, mustard seeds, cumin seeds and coriander. Another winner! And it looked so pretty and summer-like. Sum.mer! Not Fall. Here’s where things get a little nutty. Toasted coconut is added to whole milk, Greek style (or Indian, like we had) yogurt, with some lime juice and honey. Then we’re supposed to dip papaya strips into it. The Husband doesn’t like papaya, and I am not sure whether I do. The recipe says you can substitute a mango, and since the mango, which we know we like, was $1 and the papaya was $5, guess which one I chose? The dessert was fine, and tasted more tropical than Indian, but whatever. It seemed more like an afternoon snack than a dessert. 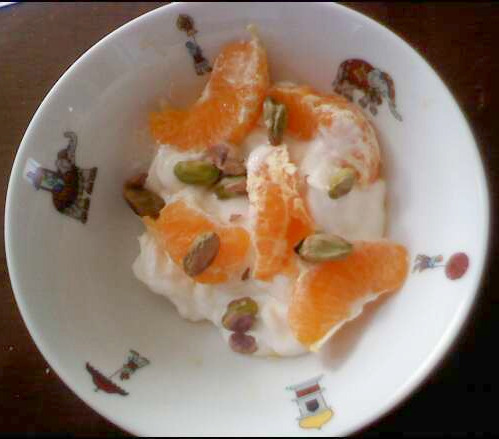 It’s very similar to her orange/yogurt/pistachio “dessert” we made earlier. In fact, I think it would be good layered like a parfait with pistachios on top. Maybe I should write a cookbook! The meal was quick to cook, full of vegetables, and the flavors were well-integrated. What’s not to like? Martha needs to go to a Seasonal Produce Identification 101 class, but otherwise I have no complaints. This week’s litany of complaints begins with the fact that I had to visit FOUR stores to find fresh mint. Obviously, this is not Martha’s fault, but one that falls directly into the laps of the buyers at the local grocery store chains, along with the blame for the fact that navy beans are nearly impossible to find, and Longhorn cheese is actually impossible to find. I digress with the beans, which I needed for some Emeril’s Bam BBQ slow cooked beans that are currently in the oven, and Longhorn, which I actually don’t need at the moment, but have in the past, for Tex-Mex goodies and a macaroni and cheese recipe. The local stores carry Shiner Bock beer, so it’s not like all things Texan are shunned. So, why the cheese hate? The next Martha Menu in the book was to be some ridiculously un-spring-like meal of roast beef with horseradish sauce, cabbage and leeks, currant scones and baked apples. !!!! I get that this was likely supposed to be a St. Patrick’s Day menu, but in order for the menu and dates to line up, I would have had to start cooking my Spring section in mid-February, when rhubarb is but a dream. This menu did not appeal to me at all at this point in the season; the azaleas are in bloom and it was 90 degrees yesterday, so baking apples seemed far from a good idea. Are the apples in the stores even good at this point? I think not. Therefore, I have made an executive decision to move this recipe to the fall, or some rainy cold spring day in the future. Am I off base by thinking that setting out a plate of carrots and radishes for your guests or family to dip into butter is weird? The “recipe” involved mixing up some unsalted butter (an ENTIRE stick! For four people! ), sea salt, and fresh dill into a compound butter. (Note that this is the second compound butter in a row). And then dipping radishes and carrots into it! Whew, that was exhausting. Or would have been if I had bothered to make it. It may surprise you, but I hate dill. Hate! Well, I like dill pickles, but that doesn’t count. So, I wasn’t going to waste money on fresh dill to mix into some butter so I can have a coronary. Then I realized when I got home that because I loathe dill so much we don’t have any dried dill, either. So, I sprinkled some parsley into a half tablespoon of butter, dipped a carrot into it, and decided it was a stupid idea. Mr. Squeaky Peanut, however, finds it perfect reasonable to serve guests seasoned butter and raw vegetables. He thought the radishes were ridiculous with the butter, but liked the carrots. Traitor! The recipe calls for a lamb steak. I don’t eat lamb, as we established previously, so I had no idea what a lamb steak was, and there was nothing labeled as such at the store, so I bought a boneless, butterflied lamb leg and cut it into cubes. The meat is marinated in a mixture of mint, fresh thyme, shallots, allspice, olive oil, and salt and pepper. She says to marinate them for 10 minutes at room temperature, or up to an hour in the refrigerator. Any fool knows you need to marinate more than 10 minutes if it’s going to work (and doesn’t contain lemon juice, which will cook some meats and fish), so I kept it in the frig for an hour or maybe 90 minutes, while The Husband made the rounds to the local record stores on his bicycle. After an hour, it appeared as if the meat might have some flavor, but I was hesitant to get too excited. The cubes were then skewered and grilled. Part of the marinade mixture was spread onto pita breads, which were supposed to bake for 5 minutes at 375. The aforementioned baked beans were in the oven at 300, so I plopped the pitas on the grill to heat. Well, it’s too bad that I don’t eat lamb, because the bite that I had for reporting purposes was really quite good! Well-seasoned and very tender. The pita was very tasty, too! Preheat oven to 375. Stir together mint, thyme, shallots, allspice, and oil in a bowl. Add 1 T salt and season with pepper. Reserve 1/3 of mixture for the pitas. Cut lamb into 2″ pieces. Add to bowl and toss with herb mixture. Marinate at least 1 hour in the refrigerator. Spread mixture onto pita breads and bake for 5 minutes (Or toss on grill). Remove from oven and tent with foil and parchment to keep warm. Heat grill pan (or use actual grill, and put the meat onto skewers) over medium high heat. 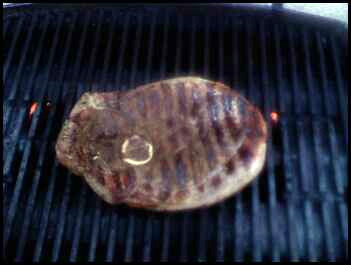 Sear on the first side, then turn until all sides are brown, about 4 minutes. Serve with pitas. I have never dealt with fresh artichokes before today. They are intimidating and stabby. And the insides are terrifying. Martha warned that there would be sharp leaves inside, and a core. But the core was furry! It was as if a celery root and a Westie had mated on Mars and given birth to …this. They also turned brown immediately upon peeling, as Martha had warned, even in the lemon water bath she had me prepare ahead of time. It’s like they were dying and turning poisonous right in front of my very eyes. If I were a cavewoman and came across them in the wild I would consider them inedible, so kudos to whomever decided they were worth trimming and eating. I will certainly never do it again. I was lucky I didn’t lose a thumb hacking those things up! Once I managed to de-leaf them and get down to the edible parts, they were simmered in a skillet with white wine, lemon juice, water, thyme sprigs, and green olives. I used garlic stuffed olives to delicious effect. These were amazing! Very lemony. Almost worth all the trouble hacking them up. Squeeze juice from the other lemon and combine with other ingredients in a medium, deep skillet. 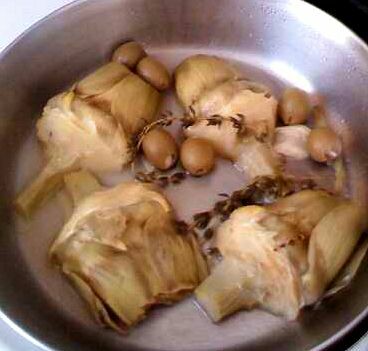 Add artichokes, cut side down. Cover and bring to a rapid simmer for two minutes; reduce heat to medium and simmer until they are tender when pierced with a fork, 15- 20 minutes. Divide amongst plates and drizzle with sauce. Here is the recipe: Spoon yogurt into dessert bowls and top each with 3-4 fruit segments. Sprinkle with unsalted pistachios and serve extra segments on the side. Anything I can make in the kitchen at work for an afternoon snack with nothing but a spoon does not qualify as a “recipe.” Assembly instructions is kind of even pushing it. That said, it tasted fine, and the creaminess was appreciated after the acidity of the artichokes and olives. The Husband turned his into an ambrosia type salad by adding coconut and green apple slices. 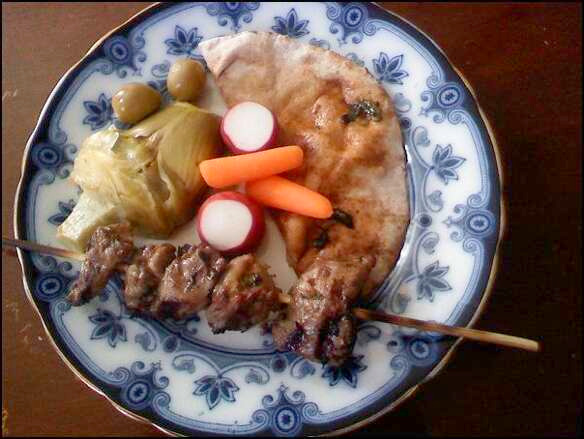 Herbed Pita and Lamb: A- for the lamb, A for the pita. Maybe it could have marinated a bit longer to get more flavor. Dessert: I am torn, because while it tastes fine, should it really be counted as a recipe? B, I guess. Hello, butter beans! I missed you. It feels like I’ve been away a week, when it’s actually only been 7 days. This is Martha’s ‘Welcome, spring’ menu, featuring “fresh foods that require little cooking and seasoning.” Ruh roh. I feel like I complain a lot, but Martha has an uncanny ability to select ingredients that I don’t like. There are tons of things in this world that I actually like to eat, but she seems to hone in on all the yucky ones. This week’s hit list includes: lamb, aioli, mint in savories, and rhubarb. It is a curious tradition to slaughter baby animals to celebrate spring in these modern times, but there you have it. The recipe calls for baby lamb chops, which I was unable to find. Instead I ordered about half a pound of regular lamb chops from a farm in my co-op. I like to picture them spending their early days frolicking around the pasture with their parents, and maybe having an early Easter egg hunt in the grass. 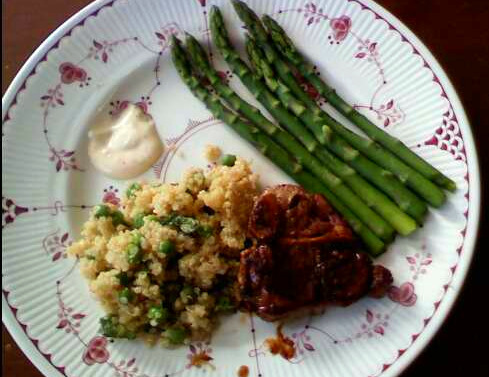 The recipe is fairly simple: sprinkle the chops with salt and pepper, then saute them in a pan. After they’re removed, lemon juice and thinly sliced peel are thrown in the pan, and then it’s all combined. The Husband, who served as taster, said that the meat itself was good, and that it “didn’t taste like turpentine.” Evidently lamb tastes like turpentine to him sometimes. I don’t even know. I am pretty meh about mint in savory things; I prefer it in gum, tea or Mojitos. I soldiered on, and boiled the quinoa in some chicken stock, then added frozen peas (couldn’t find fresh) and cooked it for a while longer. Then the mint, salt and pepper, and some olive oil were stirred in. This was SO boring. Instead of boring you with how boring it was, I will relate an exciting story that happened to me this week! (Apologies to anyone who heard this already). I had a 40% off coupon to use at the Gap, good only for Wednesday. I went to the mall, and I couldn’t find the Gap, even though I had been there before, and it was listed on the directory. I decided to go down the other arm of the mall, even though I knew it wasn’t that direction. While in front of a new bookstore that didn’t even have a name yet, and only a few shelves put up, I heard a woman calling for help. I thought at first it was someone goofing around, but I kept listening, and she yelled again, crying and screaming, “Help me please! I’m in the back!” I hesitated for a moment–what if someone had a weapon back there or something? But, since I didn’t see the security guard who had just passed by, I ran in. She was in the back, and a big stack of huge wooden boards had fallen on her, knocking her into a sitting position on a low rack of a shelf, and pinning her underneath. The boards were too heavy for me to lift by myself in a stack, but I got them up one by one, standing them on end, while trying to keep her calm. She was in shock, and I think her wrists were hurt, because she didn’t help push them off of her. When I got them all off, I told her she was going to have to move out of the way, because I couldn’t hold them for long. She eventually scooted out of the way and I let the lumber fall. She was still crying and hysterical, and we needed to get her medical help. She didn’t know the number to security but said it was in her phone, so I had to get her calmed down enough to remember where her phone was. We figured that out, security came, then she passed out briefly when the EMT arrived. She thanked me profusely; evidently she’d been calling for help for a while. I hope she’s ok. By the way, I never did find the Gap, as it had closed. Martha spells aioli with an umlaut over the first ‘i.’ Does anyone know what this is about? I am opposed to aioli on principle. I don’t see the point in adding extra fat to something just for the hell of it, a la mayonnaise. The only time I use mayonnaise is to bind together a chicken or tuna salad, and then I only use the bare minimum to make it all stick together. Like a nano portion. So, why add raw egg and fat to perfectly healthy asparagus? This was a simple recipe: blanch asparagus, then serve with an aioli consisting of an egg, garlic clove, salt, pepper, a neutral-tasting oil and some olive oil. The photo in the cookbook shows a perfectly beige sauce, while mine has flecks of pepper in it. I should have used white pepper, and I’m surprised the recipe didn’t call for it, since it’s not like Martha’s beyond asking for specialty ingredients. I added more garlic because recipes never have enough garlic for our taste. The asparagus tasted like any other asparagus you would boil. The Husband thought the aioli was pretty pathetic, possibly gross, and that it paled in comparison to Julia Child’s mayo recipe he made last year. He thought this one tasted like store-bought mayonnaise, but I disagree since this has garlic and pepper in it. He blames the use of the other oil, instead of using all olive oil. I thought eating it with the asparagus made the aioli’s garlic flavor stand out more, while he thought the aioli made the asparagus bitter. Ok, y’all, in this recipe she finally manages to merge boozy fruit with creamy old people desserts! I’m surprised it’s taken her this long, frankly. I made the rhubarb one morning before work. I boiled dry white wine with some sugar, half a vanilla bean and some water for about 6 minutes, then added the rhubarb. It’s surprising how fast that stuff cooks! In two minutes it was falling apart. I tasted a bit of it hot, and to be honest, it actually made me gag. I tried it again that night, after it had chilled, and it still made me gag a bit, but not as violently. A lady-like gag. The Husband, who likes rhubarb, thought it tasted fine, so I guess it was just me. The creamy bit calls for heavy cream, whipped with some vanilla bean seeds, sugar, and fromage blanc. I checked Fresh Market, and they didn’t have any of the fromage blanc, so I doubled the cream, per Martha’s suggestion. (BTW, the produce guy at FM cut me some fresh rhubarb when I asked if they had any. I thought that was pretty nifty). So, we made the cream, and I still didn’t like it, then The Husband baked a sponge cake to accompany the rhubarb. The End. (No photo. It looked like a blob of soggy red celery on some white stuff). In theory, having a simple meal made with fresh ingredients sounds fine, but when those ingredients involve plain asparagus, mint and rhubarb, that’s not a very exciting (or tasty) meal. It’s just too early in the season for this to work. I think in summer, when the farmer’s markets are bursting with produce, it would be different, because at that point you really can just salt and pepper a tomato and have it be delectable. This was a totally uninspired meal, overall. The only excuse for it would be if you were using up all your leftover ingredients to clean out the refrigerator. It’s important to note that the cookbook starts in spring, so this is the first meal in the book. Way to make a first impression. Lamb: C The lamb flavor was ok, but it needed more seasoning. Quinoa: C- Quinoa doesn’t have much flavor on its own, and adding some peas and mint isn’t enough to perk it up.The Husband resented the big mint leaves, saying they made the dish taste woody. We will be adding some lemon and Bulgarian feta to this mess, since of course it made a ton and we have a lot left over.